Possibly you’re like me: whenever you think of sculpture your mind wanders in the direction of monuments to greatness. Solid structures cast in bronze revering brilliant and usually, long dead contributors to culture, society or politics — memorials destined to withstand the test of time. 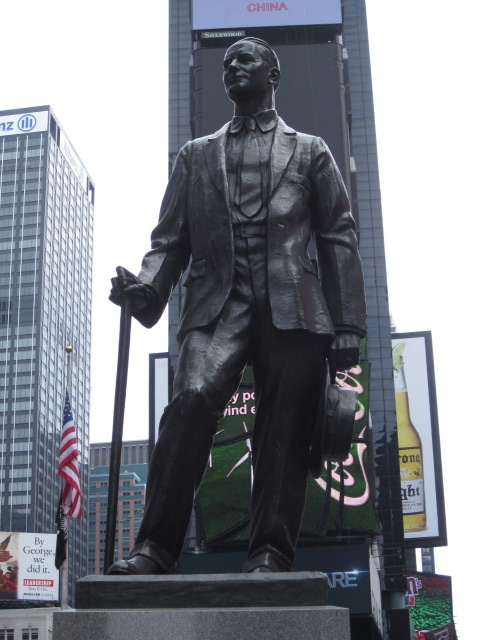 Show biz legend George M. Cohan giving his regards to Broadway. 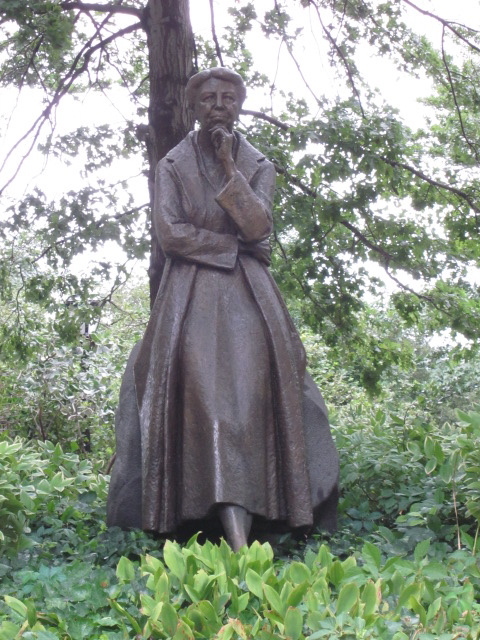 Humanitarian and first lady Eleanor Roosevelt reflecting thoughtfully in Riverside Park. 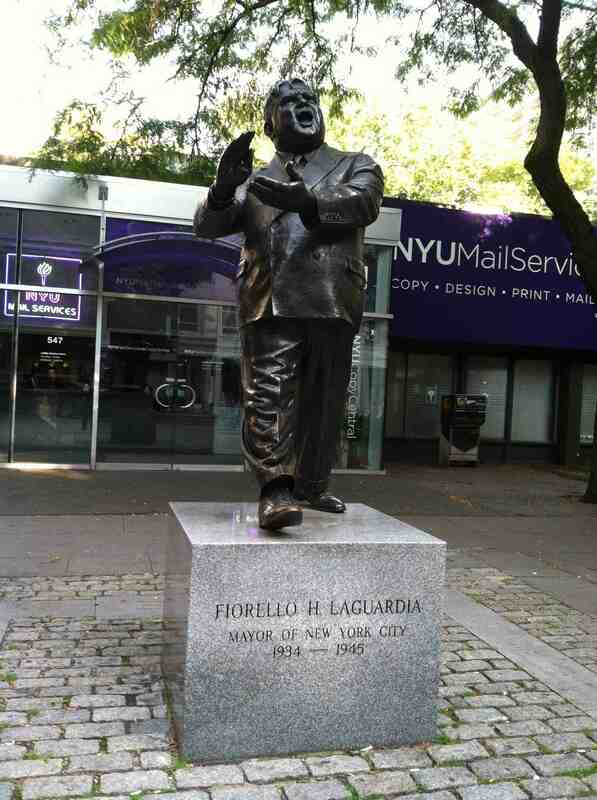 Legendary three term New York City mayor Fiorello LaGuardia applauding the weather at LaGuardia Place in Greenwich Village. 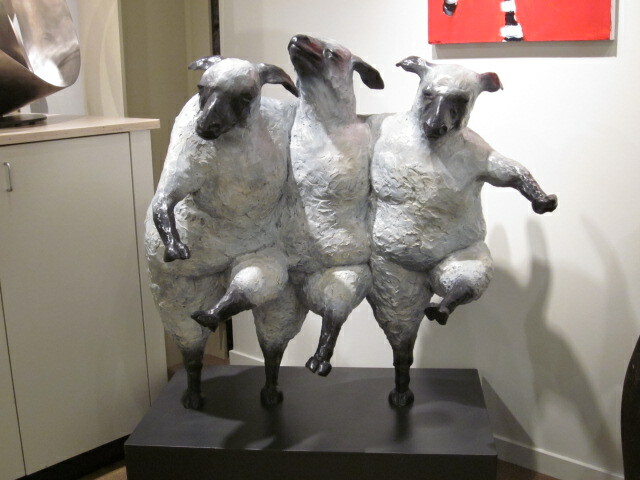 Bonus sculpture: dancing farm animals I happen to like. Then, there’s the monument from one blogger, specifically Lois over at My Cruise Stories, to another, specifically me. The choice of material, terry cloth, is spot on for the blogosphere and perfect for the author of Lame Adventures. The fact that this towel sculpture is destined to withstand the test of bath time truly tickles my funny bone. Immortalized with the greats and great bath mats. To learn how to create towel sculptures and to read Lois’ s blog about the cruise ship industry (she’s quite an entertaining authority) click here. This entry was posted in Humor, new york city and tagged arts and crafts, blogger mutual appreciation, fun, goofy, silly sculpture. Bookmark the permalink. 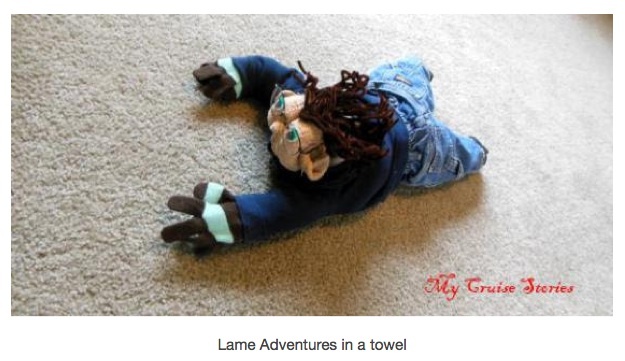 “Making you in a towel” — I went and read Lois’s post. Love it. What a superb compliment and clone. That is just too charming. I agree with you, Carol. It is a superb compliment to be sculpted in terrycloth by the Michelangelo of terrycloth sculptors! OMG! I just had a look … wow! V, I want you to know that I have been stopping by for the last little while, lurking but not commenting as I dug my way out of my editing cave. Now I have some breathing time to get back in on the fun! Welcome back to Lame Adventures, Patricia, but I have been lurking on your site, too. You no longer have a like button! I like your new book’s cover. I like the Pogues, too, Smak, but I must admit I have not thought about them in eons. I’m so glad that the (cough) educational component of this site made you see daylight on a favorite song. Almost anything can be educational if you let it. No cough necessary! Seriously, I’ll bet I’ve learned lots of stuff from your blog. NY geography springs immediately to mind. Smak, I’ve probably learned a lot more about New York writing this blog! And here’s the Baader-Meinhoff effect (http://en.wikipedia.org/wiki/List_of_cognitive_biases#Frequency_illusion) in full force. Today one of my six-year-olds was listening to contemporary, punk version of the WWI-era song “Over There.” He asks me, “Who wrote this?” and I tell him I don’t know, but I’ll find out. Sure enough, it was Times Square’s favorite bard. That’s great, Smak — and thanks for sharing! Isn’t that wild when it happens? Recently, that occurred about something between my friend, Coco, and me. Unfortunately, my mind has a hole in it the size of the sky so I don’t recall what that something was. Hey, how many six-year-olds do you have? Are we talking a pair or more? Just a pair of six-year-olds. I also have a five-year old. I’m a poor-planner, as is my wife. But you guys must be in great shape herding three small fry. Or, exhausted. An incredible likeness. I thought I was seeing double. Now, we must get Lois to recreate Reggie in a towel! Thanks for the tribute to my blog. I wish I had your knack for witty comments. You do bring out the best in this landlubber, Lois. It’s a remarkable likeness. You must be flattered. I think the dancing sheep are funny. I see why you included them. I am indeed flattered, Jim! I have been waiting about three years to figure out how to sneak that sheep shot into this site. Now I can scratch that off my bucket list. Is there a sci-fi thriller horror movie called ‘The Towel People’? That premise probably has potential, Jim. Hey, Hollywood brought us Planet of the Apes. V, that’s awesome you have a towel monument! That is incredibly cool, man. How can I get one? Does she make them? I will pay her a visit. I’m just marveling at all the art work you have in the city. We are art starved in surburbia. Love the sheep! Amy, it is a privilege to be honored in terrycloth by such an accomplished towel sculptor. I will never look at a washcloth in quite the same way again. New York is indeed an art lover’s paradise, but the dancing sheep actually hail from an art gallery I visited in the Napa Valley in 2011. I’m on a roll, Mag! I’m doing as well as possible, and I’m lucky I have such supportive siblings. Art, honor and functionality. The perfect trifecta. Congratulations. Yes, being sculpted in terrycloth is quite an honor and still being alive to appreciate it is even better. Immortalized in Towel? Wow–quite an honor. And, I’m seriously impressed by her towel folding skills. I think there should be a Lame Adventures Cruise. THEME PARTY! 🙂 Towel folding contest. What a great idea in theory, Ginger! Considering that neither Milton nor I can swim, that cruise should probably be on a docked ship. I can best fold a towel into a square. And even more so when someone taps a keg. Possibly towel sculpting should be left to the truly talented. Small towels would be a dreadful surprise party. Quite crafty. I wonder how he’d fare against an Ozark Snotmouth? I’m afraid he’d be one-and-done. If you dare Lois, Russell, she’s so creative, she just might take on the challenge. How adorable! You look good in a towel! Thanks! Lois gives good towel sculpture Jean. I admit, I had to go look at how you were rendered in towels. Fabulous you were mortalized (you wouldn’t last long obviously). As to the rest, I love the statue of Eleanor Roosevelt, she is one of my heroes. Being (what a perfect word) mortalized, Val, in terrycloth was an honor I didn’t see coming, but I thought it was fabulous, too! That ER statue is near my sanctum sanctorum. I think it’s my favorite. I greatly admire her, too.